The Cantina plastic tables provide seating for eight and are most commonly seen at schools, hospitals, and amusement parks. Designed to endure the outdoors and present an attractive atmosphere indoors as well. The recycled plastic frame is virtually maintenance free and wont fade, rust or splinter. 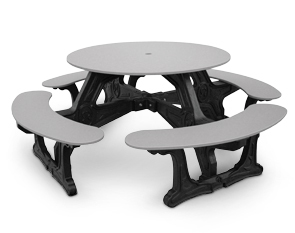 Plastic table tops and seats available in an assortment of colors and the frames are black recycled plastic. An umbrella hole in the center is standard and measures 2" in diameter.